This is my very first stamp set that I designed (with lots of help from Gina!). 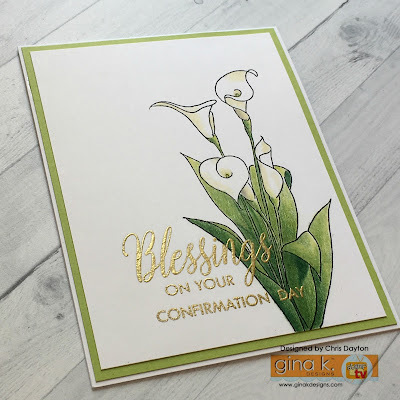 Calla Lilies are a floral I've always loved, and it includes many of the sentiments that I find lacking in my stamp arsenal. Gina challenged me to design a set that I wanted to teach with at an event at her store in Greendale, WI, and this is what I came up with. And now that people are getting their orders, I can't even begin to describe how it feels to see the beautiful projects people are making with this set. Thank you. This card is a mix of watercolor for the background panel, and colored pencils. I selectively stamped five of the single Calla Lilies with Lemon Drop and Jelly Bean Green inks onto Artist's Choice cardstock and colored them with Prismacolor Pencils. (colors used: Orange Mineral 1033, Goldenrod 1034, Yellow Ochre 942, Sand 940, Cream 914, White 938, Olive 911 and Chartreuse 989). I hand trimmed them out and added them to my watercolored panel (I used Dr. PH Martin Radiant watercolors). The sentiment was added in Versafine ink, and I added a strip of Jelly Bean Green cardstock and a ribbon, which I had colored to match by swiping my ink pad over it to color. Just a note: Once the inked ribbon was dry, I did scrunch it up within a baby wipe for a bit to remove and lighten the ink a bit. Then I let it dry again fully before assembling the card. This card and the one below were my samples for my Prismacolor pencil class in June. I used Gina's Artist's Choice Cardstock. I love the smooth texture of that paper when using pencils. 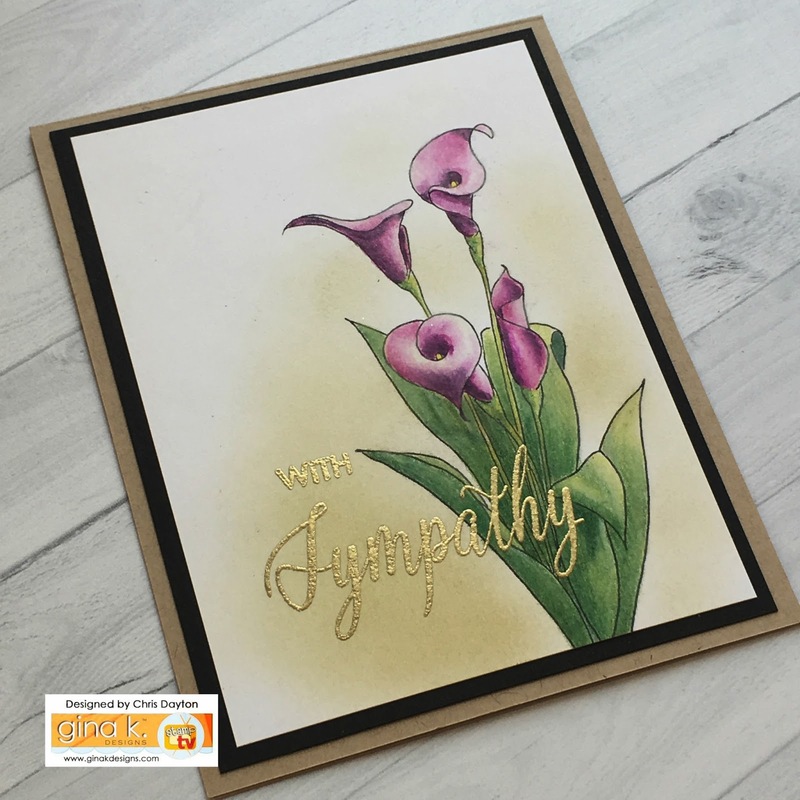 This has a Kraft ink sponged background with the greeting embossed in gold. I used Prima Confections watercolors to loosely paint this one. This is masked and heat embossed in white before watercoloring with Sennelier watercolors. I used the Wild Wisteria Fancy Foil and Polka Party Foil Mate paper to create a fun shiny background. This month's incentive set, Happy Mail. A simple greeting card using the envelope and greeting from the new incentive set, Happy Mail. 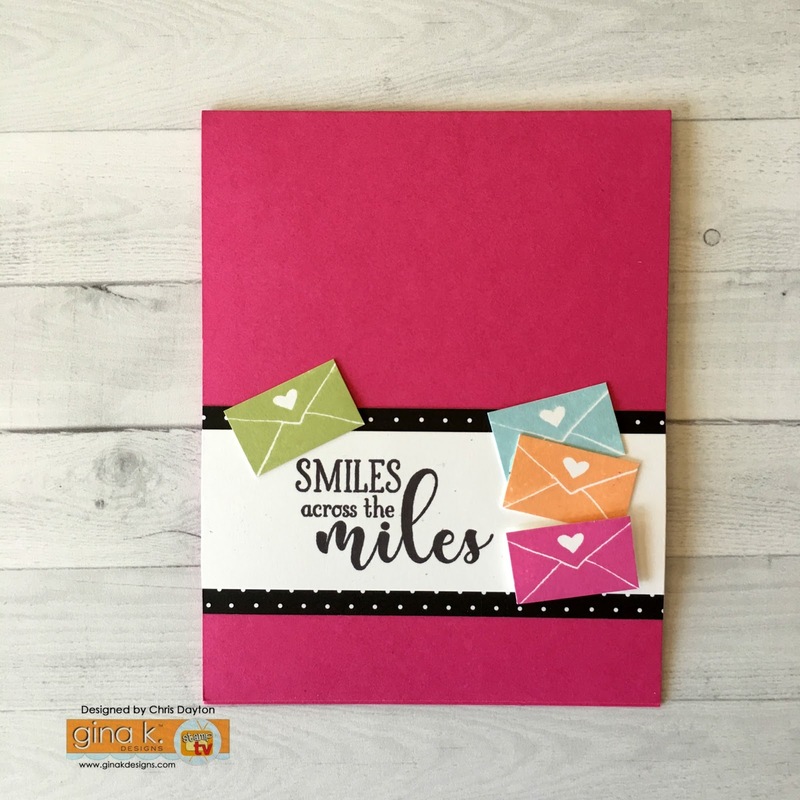 Happy Mail is available free with your $75 order while supplies last. 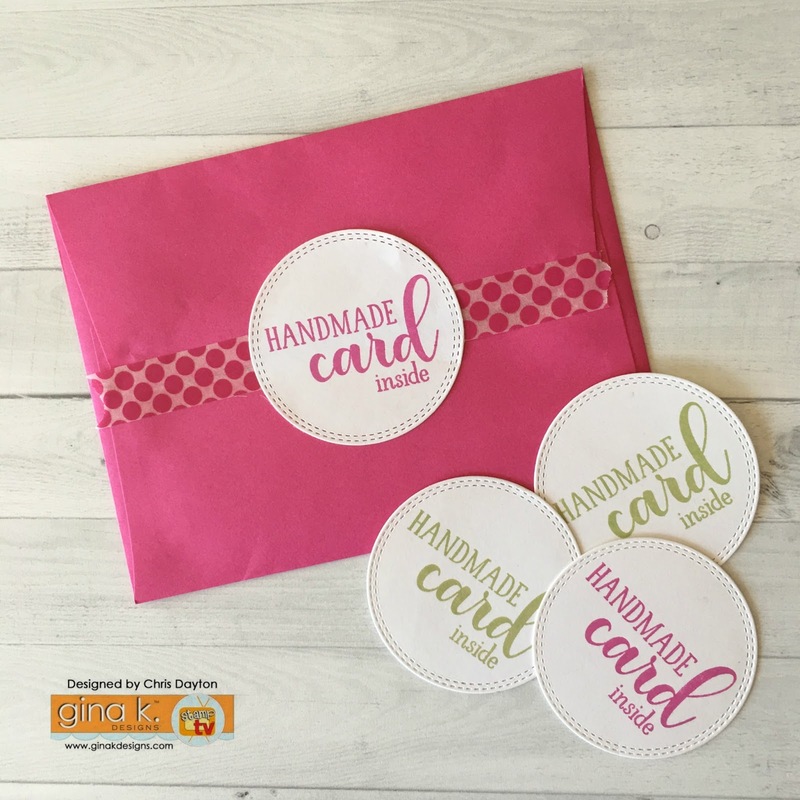 I used the Double Stitched Circle dies to create fun envelope stickers using adhesive sheets. It's fun to dress up an envelope with washi tape and stickers made with the Happy Mail set. all your lily cards are really small works of art! and love how you have used the mail stamps. Beautiful, love the watercolor looking backgrounds. Congrats on your first stamp set. I look forward to seeing more sets. The lily images are so elegant for so many occasions. I love your bold sentiments as well as the smaller mix and match sentiments that are great for so many occasions. Your cards are all gorgeous. I love the last one with the purple lilies with the sweet bow. Love the idea of making stickers with the Happy Mail set. Beautiful cards. I love this set and looking forward to CASing many of the ones I see today. Thanks so much for sharing and inspiring us. They are all lovely and making me want to get inky today! I love the variety of the different coloration of lily cards. All beautiful and each gives a different vibe. Love the variations with Lily, so many possibilities and love the watercolor BG on first one, so pretty! Really love the watercolor backgrounds. Very pretty cards. Do you have a class on doing the water color backgrounds? Such awesome-ness! No, I don't. I'll have to try a video again some day. Your lilies are beautiful. Love your wataercoloring!! Just wet that area of the paper and drop/dab paint in with your brush - it will bloom and spread to make that mottled look. Let it dry (it will be faint), then do it again (and again, if needed) until you are happy with it! You can heat emboss to help the watercolor from bleeding into your image, or use a masking fluid. Use 140# watercolor paper. That can handle lots of layers & water. I adore Calla Lilies. They always make me think of my dad. Your first stamp set is beautiful! Can't wait to get it! Love this set! My favorite card to the first one. Would love to get that look. Lovely cards and cool ideas for the incentive set. Wonderful design - the lilies are gorgeous! And I love the cards you made with this set. I agree with the others - your watercoloring is wonderful. Beautiful cards, Chris! And some great tips, especially about the ribbon and how to lighten it a bit! Love your ideas on the incentive set! Gorgeous cards and stamp set! So pretty! Love the incentive set too! Lots of uses! Excited for another day of hopping and inspiration! Beautiful set! Love your beautiful cards and the details you shared. I love, love your stamp set and your sample cards. I can see myself using it over and over. Your cards are really fantastic. Fantastic cards - the Prima Confections watercolored one is my absolute favorite! Love this stamp set! Can't wait to try it. Beautiful cards! Love this stamp set! Wow, your water coloring is outstanding! TYFS! 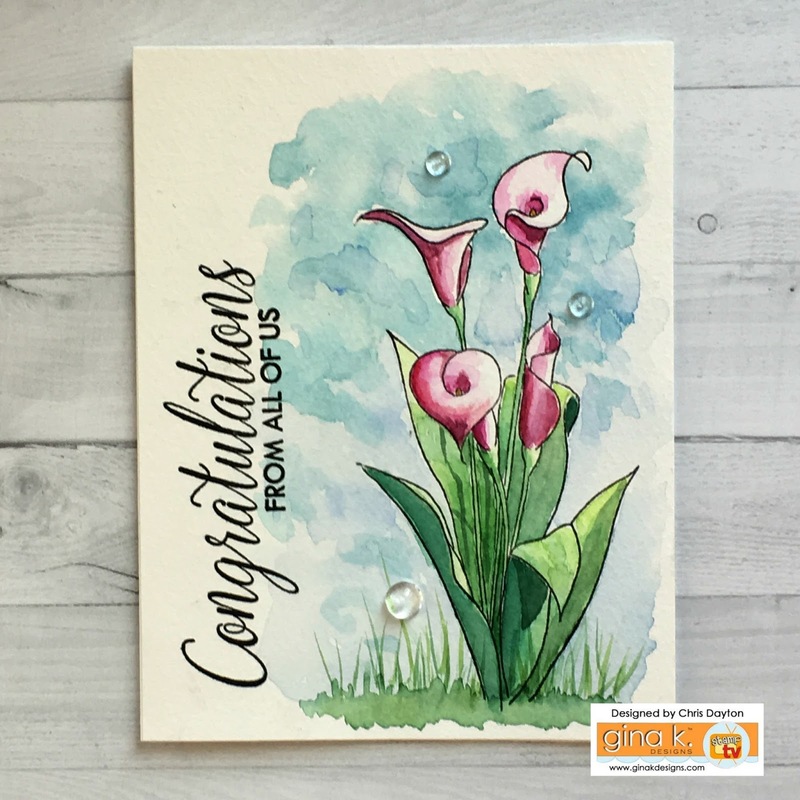 Love this calla lily stamp! Your work is great! Love your stamp set! And your coloring is as always, gorgeous! Gorgeous cards made with you very own stamp sets! Love, love, love these cards! Your calla lily stamp set is perfection! It saved me last week! My husband texted me that he needed "my best" sympathy card (for his boss who lost her mother)...so I used this set! Cala Lily such a beautiful set! Love the variations of how you colored your callas--they're all so beautiful. them - and all spectacular. Chris, I love your new stamp set! Your cards are beautiful. Thanks so much for the inspiration. I love this set - and the singles bunched into a bouquet - stellar! Oh, your cards are just beautiful!!! I especially LOVE that adoption day card...and your card with the incentive set is cute too...love the little envelopes! Congratulations on your stamp set design. I love it and all the cards you made with it. Also the cards with the incentive set are wonderful too. All the cards are just beautiful. Thanks for sharing. Love you stamped. The cards are lovely. The stamps are so versatile. Congratulations on your stamp set. 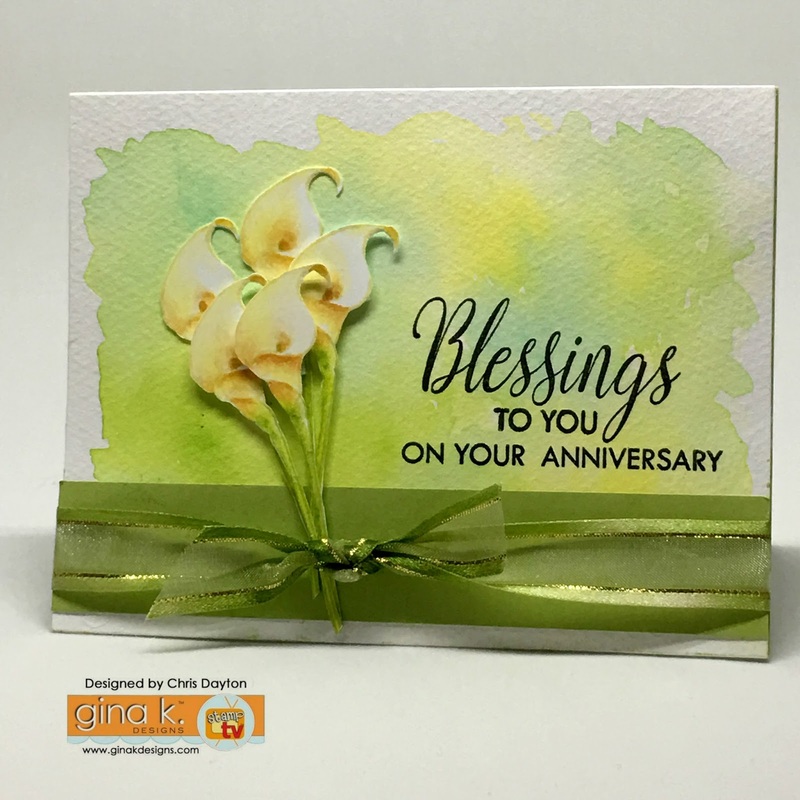 The sentiments are wonderful and along with the lovely calla lily will be used for many occasions. Such beautiful sentiments in this kit! And your cards and coloring are beautiful! Oh my! So very pretty!!! Congrats on a beautiful new set. Love the Calla Lilies. All of your cards are stunning. Your Lily stamp and cards is beautiful. Your cards are beautiful! Congrats on your new set. Beautiful, beautiful cards. Love them all! 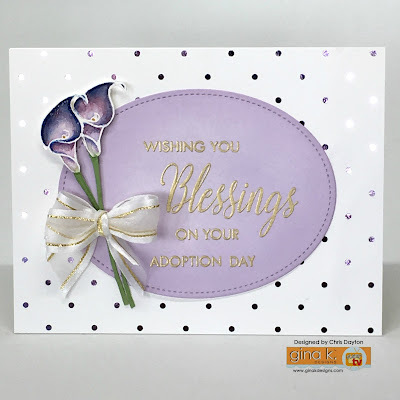 The Calla Lily set is beautiful and so are all of your cards! Your cards are so beautiful. Thank you for sharing them. I love your work and those calla lilies are truly gorgeous in each design. Gorgeous cards, Chris! Congratulations again on your first stamp set...love it! Congratulations on your first stamp set which is absolutely gorgeous! Your cards are all beautiful but that anniversary card made my jaw drop! I love the stamp set you designed...thanks for teaching me how to color it! Thanks for sharing all of the different variations too. What a great stamp set, Chris! You covered all those special occasions we never have sentiments for! Love the colors you used with the incentive stamps. Chris - I just LOVE this stamp set! Thanks for teaching me how to color it. Wow...this lily stamp is wonderful and your cards reflect the range of application and done so...BEAUTIFULLY!!! your stamp set is absolutely gorgeous and so are your cards! STUNNING - EACH AND EVEERY ONE!!! A very versatile set...congrats! Oh my gosh, your cards are stunning. LOVE what you have done with that lily, and the Happy Mail cards are so stinkin' cute! Thanks for the great inspiration! Your cards are gorgeous and congrats on a lovely stamp set. Your cards are beautiful and your set is just Gorgeous!! The cards are simply beautiful! Love the stamp set too. You are very talented. The cards are absolutely stunning. Beautiful floral cards and I like the colorful envelopes and envelope stickers. Beautiful cards! The calla lily is absolutely fantastic! I just love all the different ways you colored the lilies! What an elegant and versatile set! I love the different takes you did on them. I think my favorites are the watercolor and the purple! Love your beautiful work. I have to say, the lilies with the foiled background is my favorite. Wow I like the elegance of your cards using the flower. Awesome set.